Mt. 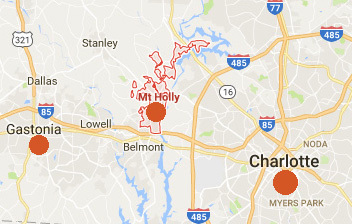 Holly, North Carolina, is about 13 miles northwest of Charlotte, NC. Twelve miles further west from Mt. Holly is Gastonia, the location of one of the most shocking horse mutilations on record that occurred February 22, 1980. See last segment of this report. January 19, 2017 Mt. Holly, North Carolina - Tuesday night, January 17, 2017, beginning at about 8:03 PM Eastern, the Channel 9-WSOTV newsroom in Mt. 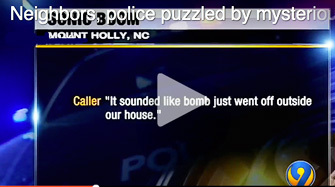 Holly, North Carolina, began receiving dozens of calls from viewers reporting a mysterious, loud, house-shaking boom. Channel 9 reporter Ken Lemon learned Mt. Holly police and county dispatchers also received over thirty 911 calls in a couple of hours from worried residents trying to find out what caused the bomb-like sound. Channel 9-WSOTV news report, Mt. Holly, North Carolina, on Tuesday night, January 17, 2017, four nights after another loud boom was reported on Saturday, January 14, 2017. City and county authorities still have no answers.